In the early 1900s, gold production again declined as the mines were getting so deep that it had become too expensive. Secondly, inflation during World War I caused the price of other commodities to rise while the value of gold stayed constant at about $20.00 per ounce. By 1920, the value of gold had changed to at least a 10 to 1 ratio in favor of other commodities. As a result, most mines in the area suspended operations, and many businesses closed. This caused the population of Central City to drop from 3,114 in 1900 to 553 in 1920. During this time, many frame houses in Central City, Black Hawk and Nevadaville were torn down and the lumber taken to other parts of the state for construction of new residences. Many other houses were abandoned to the elements, tax roles, and vandals. During the 1930s, there was some recovery in mining due to an increase in gold from $20 to $35 per ounce and the cheap labor provided by out-of-work men after the depression. In 1932, the Central City Opera House Association began producing summer festivals, which stimulated interest in the city. Many people began buying old residences for summer and weekend retreats, which brought a small economic revival to the area. At the beginning of World War II, the government prohibited commercial mining of gold, in order to direct labor into the war effort. This act sent gold mining into a tailspin from which it has never recovered. After the war, some mines occasionally reopened, sputtered for a while, and reminded everyone of Central’s former grandeur. Then, like old soldiers, they would fade away. There are still vast quantities of gold ore beneath the surface of Central City and the surrounding area. However, it is not economically feasible, in most cases, to produce it. By the mid-1980s, many citizens recognized that other attractions were diverting tourists from Central City. Major ski resorts began enticing tourists to their areas during the summer and fall. Economic downturns and especially the energy bust of the early 1980s contributed to the decline in tourism. Central City recognized that they did not have the tax base to adequately maintain its infrastructure and new sources of revenue had to be found. In 1989, a group of citizens formed Central City Preservation Incorporated and began working toward the legalization of limited gambling as a way of attracting tourists back to Central City. 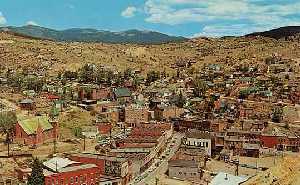 In 1991, a statewide referendum legalized low stakes gambling but limited it to three famous gold rush towns: Cripple Creek to the south, and tiny Blackhawk and Central City. Many casinos quickly sprang up in both Central City and Blackhawk, but the majority of the emphasis was on Blackhawk. Many of the casinos in Central City have already closed and Central City is once again searching for ways to enhance its livelihood. Central City’s appearance today is very similar to how it looked over 100 years ago. After the fire of 1874, the business district was constructed to last – with only buildings of brick and stone being built. There would be no more wooden buildings with their ever-present potential for destruction by fire. On Eureka Street, from the Court House to Main Street, only one building that existed in 1874 is not there today. That was the white wood Presbyterian Church which stood between the Teller House and the Opera House. Even Henry Teller’s Law Office, built about 1860, still survives. On Lawrence Street, from Main street East to Raynolds’ Court, most of the existing buildings were erected in the 1870s. On Main Street, only the buildings on the South side of the Gold Coin were built after 1900. The Roworth Block even survived the fire of 1874 and dates to the 1860s. Outside of Central City lie four cemeteries with hundreds of ornate stone markers and intricate grillwork, with headstones dating back to the 1860s. Just outside of town, remnants from the mining days are abundant. One mine is on a hill just above the Central City Cemetery. 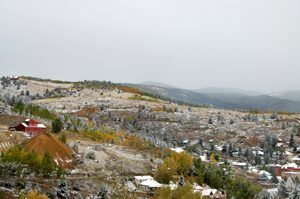 According to geologists and experienced miners, there are over 17,000 mining claims in the southern end of Gilpin County. For safety reasons, most of the mines have been ‘capped” with concrete slabs or have been filled in. Many people seem to think that gold mines run horizontally into the side of a hill and that it is safe to enter them. However, this is not true. Gold and other precious metals were forced up through weak spots in the earth’s crust. 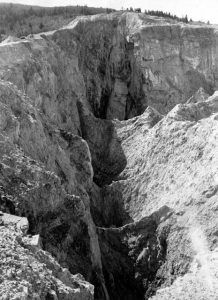 In order to follow the “vein”, shafts were often dug straight down for hundreds of feet. The deepest shaft mine in the area is reported to be over 2,000 feet. Central City is on Highway 160 35 miles west of Denver. Central City is also said to be haunted by several restless spirits. Click HERE to read about the hauntings. All images available for photo prints and editorial downloads HERE.